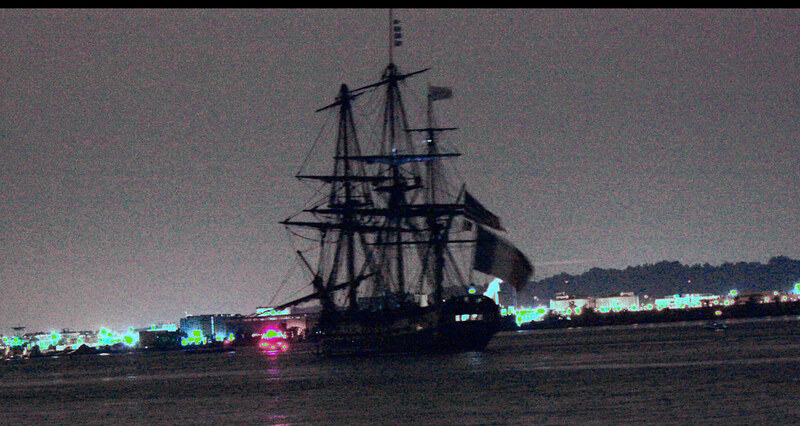 It was thrilling to see the French Tall Ship ‘Hermione’ pass through the opened Wilson Bridge at midnight. Adding to the fun were all the people out with us who were equally impressed by, not only the Hermione but the mechanical marvel of the Wilson Bridge. As a side note, living in the Washington DC area makes me empathetic for anyone “stuck” on the bridge. Even at midnight, I could see the line of cars and trucks. Night photography is a challenge for me ~ mostly because I don’t do much of it. My attempt to photograph the Hermione at midnight convinced me to practice, practice, practice. With that in mind, I’ll be up late on Friday when Hermione leaves Old Town en route to Annapolis attempting to get better shots. Earlier in the day, the Hermione was anchored near Mount Vernon Estates where a Lafayette event was happening. Yes, the French and American relations go back to our beginning as a nation. 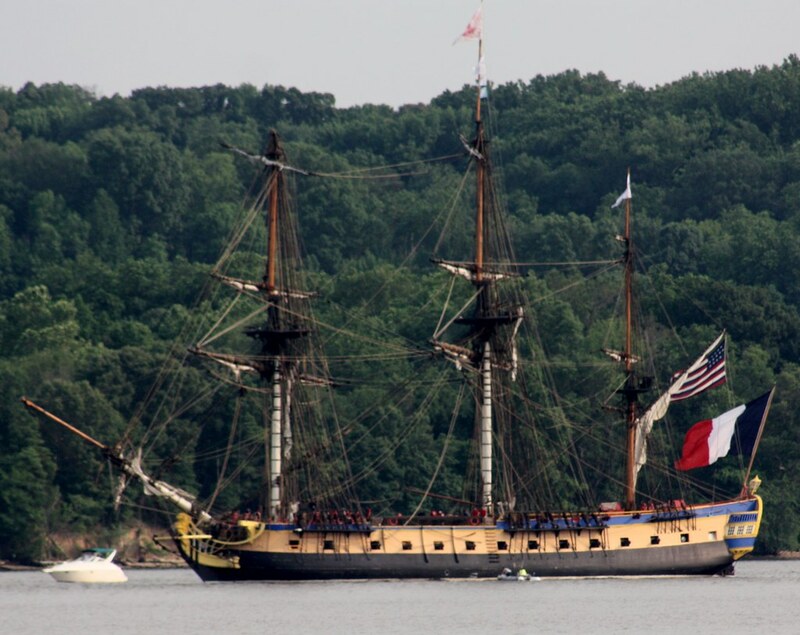 The Hermione was only in the DC area for a week or so. and I’m thrilled I got a chance to tour it. Would love to see it in its home port in Rochefort, France. We’re an old couple. Two centuries plus of common law wedlock. Lingering love and bickering. Has the “Belen” sailed to the US? Lots going on in DC this summer. Would love to see you again ~ let me know when you’re in town. I will definitely let you know! Thank you, thank you! This is so cool and I don’t think I’m going to be able to see it while it’s in town. I love the sense in the one picture of the ship in motion. 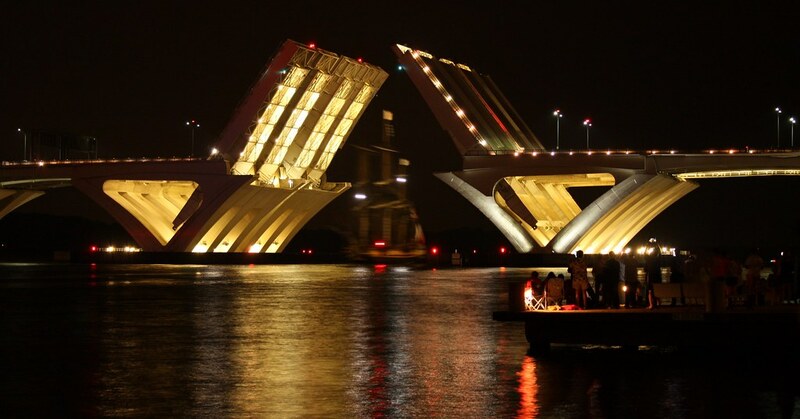 And yes, the Wilson Bridge is beautiful…. Good effort, Patti, especially on the location you found with the Capitol Dome in the background. Also the catch on the Mount Vernon image earlier in the day. Thanks also for the link to my post. Looks like we both will be doing another post soon after the public tour today. Can’t count the times we passed over the Wilson Bridge but never saw it open and certainly never saw it like this — beautiful. Thanks! It was fun to finally see it open. How exciting. I love tall ships. Your pictures are pretty good. I get the feel for the evening. Good luck on Friday.